Felipe Pazos’ professional activities have dual aspects: those based on his intellect and those based on his active involvement in the issues of his time. This is true in general as well as with respect to the role of institutions in Cuba’s transition from socialism. While I will spend most of my time on the former type of contributions, it is especially appropriate to begin with the latter in the context of ASCE. Felipe played an unusual role in the birth of ASCE as an institution. When we decided to create ASCE as a professional association in the summer of 1990, we adapted a constitution used by the Indian Economic Association. Our adapted constitution had a provision calling for the outgoing President to be an ex-officio member of the Executive Committee (in order to provide continuity in the management of the affairs of the Association). Since we were starting, we had no outgoing President. We thought immediately of asking Felipe to become the first ex-officio president of ASCE. By doing so, we wanted to accomplish two things: establish a link with older professionals who, in contrast to the organizers of ASCE, had originally established themselves as professionals in Cuba rather than in the United States; and, have the Association share in the immense prestige that he enjoyed for his insights into economic affairs. It is my sincere belief that the unqualified support Felipe gave ASCE and his willingness to participate in one of its most visible early activities played a crucial role in ASCE’s ability to establish itself immediately as an institution committed to excellence in its endeavors. Herein lies one of Felipe’s contributions to the institutions affecting Cuba’s transition. The functioning of a market economy requires the services of auxiliary institutions of different types– banks, insurance companies, stock exchanges, trade associations, firms of stockbrokers, finance houses, etc. These institutions help enterprises finance their working capital, insure against risk, increase the value of their equity and sell their products. Hence, it will be necessary to create or bring from abroad this type of institution. But this should not be difficult, because in the exile community there are many well trained persons in these areas who could return to Cuba as individual technicians or by bringing subsidiaries or branches of enterprises that they already have elsewhere. Moreover, Cuba could open its doors to foreign enterprises that provide these types of services. Given the absence in Cuba of entities providing financial and commercial services, except for the National Bank which provides these services to state enterprises, and given that these types of enterprises cannot buy assets at infinitesimally small prices, it would be highly advisable to open widely for them the doors of our economy. Today we recognize a wider role for institutions in development and transition processes than the one captured in the quotation. Yet, in 1990 not many writers were stressing the role of institutions emphasized in the above quotation. We shall proceed by evaluating the relevance of Felipe’s points in light of what we have learned in the ten and a half years since the two paragraphs under quotation were written. The first paragraph contains three main ideas: 1) the institutions listed there are important, even indispensable, for the efficient functioning of an enterprise system; 2) they have to be created or imported into a socialist regime such as Cuba; and 3) this would be easy to do in the case of Cuba in one of two forms: either by taking advantage of the capabilities of Cuban exiles with substantial experience in these areas as individuals or as firm owners or managers, or by taking advantage of the ease of importing foreign enterprises operating in these areas. How important economically are these “auxiliary” institutions that are necessary for the functioning of the free enterprise system? If we adopt a narrow definition and limit ourselves to those ones explicitly mentioned in the quote, we find that they correspond most closely to the sector of economic activity classified by the U.S. Bureau of the Census as FIRE (namely finance, insurance and real estate) in its tenfold division of the components of the Gross Domestic Product (GDP) of the United States. In 1998 this sector accounted for 18.9% of US GDP (measured in constant 1996$) according to the U.S. Statistical Abstract (2000). Furthermore there are other sectors necessary for enterprises to sell their products, but not included in FIRE, that exist at a very low level in socialist countries, for example wholesale and retail trade and business services. In 1998 these sectors, by themselves, accounted for 22.1% of U.S. GDP (also measured in constant 1996$). Hence both types of sectors together accounted for 41% of U.S. GDP in 1998. Whether one uses the narrow or the broad interpretation, there is no doubt about the importance of these sectors for the functioning of a market economy: their operations generated between 18.9% and 41 % of the value of final goods and services produced by the largest market economy in the world in 1998. With a bit of ingenuity we can use earlier research to estimate an upper bound for the potential contribution of these sectors to socialist Cuba’s GDP. 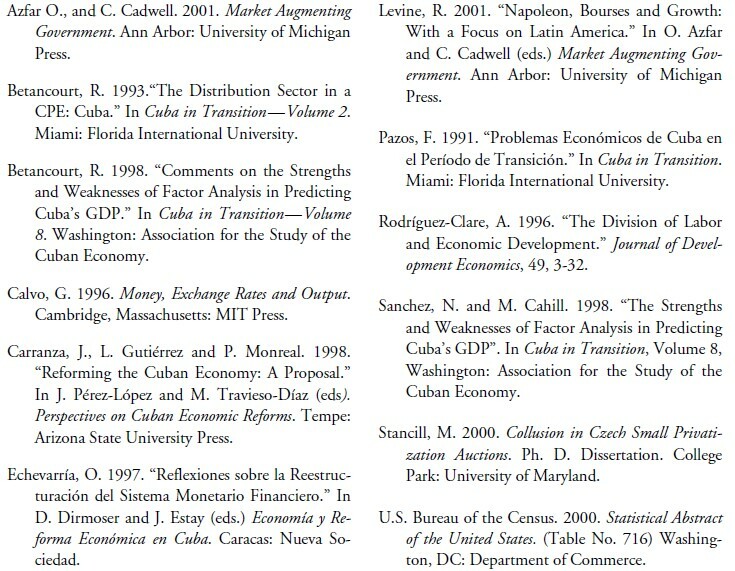 In a clever paper, Sánchez and Cahill (1998) applied factor analysis to socio-demographic data for 19 Latin American countries as well as Cuba and generated seven factor scores for each country that are used as independent variables in a regression using GDP data for the 19 Latin American countries as the dependent variables. The resulting coefficients and Cuba’s earlier factor scores can then be used to obtain an estimate of Cuba’s GDP. The GDP estimate that they obtained, however, was 100% above an alternative estimate of Cuba’s GDP in terms of dollars using purchasing power exchange rates available elsewhere. Betancourt (1998) argued that the reason for this overestimate was precisely the fact that sectors such as banking and insurance existed in the economies of the 19 Latin American countries and were captured in their GDP while they did not exist in Cuba. Similarly, wholesale and retail trade sectors also existed at a high level in these countries and were captured in their GDP data while they existed at a much lower level in socialist Cuba. If we attribute all of the overestimate to these sectors, which is clearly an upper bound, we can argue based on Sánchez and Cahill’s overestimates that 50% of Cuba’s GDP during a transition would have to be devoted to these necessary functions for enterprises to operate in a market economy. While this figure is an upper bound, even cutting it in half yields a sizable amount of final goods and services that have to be generated by these sectors in a transition. Clearly Felipe’s view that these sectors are important is consistent with what we have learned since he wrote the paper. Similarly, the second idea—that the institutions associated with the narrow interpretation (FIRE) did not exist in socialist Cuba—is noncontroversial as well as consistent with what we have learned since then. For instance, China, with a far more developed market economy than Cuba is still struggling to figure out how to develop an insurance market as well as a housing market. It has had somewhat more success with banks and stock markets but there are serious problems in both cases. That the institutions associated with the broad interpretation function at a low level in socialist Cuba can be inferred from Betancourt’s analysis of the distribution sector (1993). What is more controversial, however, is the third idea—whether the creation or importation of either the narrow or the broad institutions is an easy task. Indeed, hindsight is far less kind to some aspects of Felipe’s third idea. A simple statistic highlights another aspect of the problem in developing financial institutions. The ratio of credit to the private sector to GDP is quite low (less than 50%) in Latin America and most developing countries compared to developed countries where this ratio is unity or higher. The underlying issue is the same. A lack of a legal framework that provides incentives for credit markets to develop for a variety of reasons. For instance, in countries where inflation is endemic, mortgage markets disappear. If laws and their enforcement prevent repossession, consumer credit is low or nonexistent and this absence gives rise to institutions that compensate for its nonexistence, for example Rotating Savings and Credit Associations. It turns out that Felipe’s third idea fares better with respect to the other main type in the broad set of institutions needed for efficient operation of the free enterprise system, namely the distribution sector. In most transition economies, this sector—especially at the retail level—expanded rapidly during the transition. The reason for the difference is not hard to find: the transactions involving this sector entail exchanges in which the gains and costs of the exchange accrue at or close to the time and place of the transaction, which enhances the incentives for fulfillment of the conditions of exchange. In contrast, in financial markets the gains and costs of the exchange are usually far apart in terms of time or space. For instance, you pay for your life insurance for ten years but your family collects, for example, only in the tenth year if you pass away. The second paragraph of the quotation raises additional issues. Felipe states as an aside that the National Bank provides commercial and financial services for state enterprises in Cuba. But the dissatisfaction with the current banking system expressed by Cuba’s own economists, Echevarria (1997), and the failure of reformists to suggest the use of the interest rate as an allocative mechanism for state enterprises, Carranza, Gutiérrez and Monreal (1998), would indicate that these financial and commercial services to state enterprises are very far from optimally provided. Thus, their provision would require some attention during a transition. Indeed, the prominent role provided by inter-enterprise arrears as a means of credit in transition economies4 indicates the need to devote attention to this issue in a Cuban transition, unless all state enterprises were eliminated immediately. The latter event has not occurred anywhere. In this second paragraph Felipe notes that there would be no (domestic) assets for these auxiliary (foreign) enterprises to acquire at bargain prices. While this is true for the financial ones he listed explicitly in his paper, this would not be the case for the ones representing the distribution sector, and attention to his concern about the sale of assets at bargain prices would be necessary. Indeed, an analysis of the Czech small privatization auctions, Stancill (2000), verifies that Felipe’s concerns did materialize in this case, but it also provides suggestions on how to prevent the problem at least in the case of sales through auctions. Since Cuba has started on a transition of sorts, one can ask to what extent are Felipe’s concerns at the time he wrote the paper valid in today’s Cuba? With respect to institutions and to the institutions necessary for the functioning of the free enterprise system, the progress of reforms has been so slow that one can safely argue that his arguments on these points have not been superseded by new knowledge or other experiences and remain equally relevant today. One of the reasons Felipe remained eternally young intellectually was that he was willing to have his ideas challenged by reality as well as by others through the mechanism of professional exchanges. Hence, the fact that not all of his ideas were validated by reality or subsequent work would be a surprise to anyone but Felipe. Furthermore he would be the first one that would want the invalid ones pointed out, since he wanted Cuba’s transition to be as successful as possible and thought our profession could help in that endeavor. The comments in this paper are intended to honor him by being faithful to the wonderful example of his life and work. 1. His essay (Pazos 1991) was in Spanish and the two quotes here (from p. 253) are my translation. 2. For instance, see the papers in the volume Market Augmenting Government, edited by O. Azfar and C. Cadwell (2001). 3. A visitor to the stock exchange in Budapest during the summer of 1992 would have found a very attractive building, all the electronic gadgetry of a modern stock exchange and a ticker tape with no transactions taking place. 4. For example see Calvo’s papers on the subject in his collected works, Calvo (1996). 5. Incidentally, this argument also raises further doubts about the third idea in Felipe’s first paragraph.